In a Bar, Under the Sea: Belgian rock band dEUS inhabits a far territory between Ministry and Tom Waits. THE BIGGEST myth at SXSW--the South by Southwest Music and Media Conference held every March in Austin, Texas--is that unknown bands get signed there. That may have been true once, but 11 years into its existence, the conclave--which draws some 7,000 music business types and features more than 700 band showcases in the course of five raucous days and nights--is more oriented toward publicizing already signed acts. Thus, critics are able to gauge the new bands that are most worth covering in the coming months, which is exactly what I did with my time in Texas. The following six groups stood out, thanks to the excellence of their showcase performances. All have new records out, and several are currently on tour. dEUS: Deus is a five-piece Belgian act whose music sounds like a cross between Tom Waits and Ministry--with a little bit of Crime and the City Solution thrown in for good measure. Live, the band kept an uncomfortably overpacked house wholly riveted, thanks in part to the strange, multilayered vocals created when the singer used different microphones with different effects pedals within individual songs. There was an experimental edge to the group's eerie, rhythm-driven songs, but Deus' new record, In a Bar, Under the Sea (Island), also contains many orchestrally arranged ballads, with romantic lyrics about the weirdness of urban life. Coming in the middle of a very fallow time for rock, the album sounds like a masterpiece to me. In a Bar comes out in America this week, and the band will open for Morphine at the Warfield in San Francisco on March 31. Bis: Bis is a trio of gawky Glaswegians who have taken the lo-fi-DIY-cutie-pie ethic of K Records to heart. A year ago, the group's extremely indie EPs Disco Nation and Bis vs. the DIY Corps were being wildly lauded in London for being a reaction to England's twin evils: electronica and Britpop. Like its U.S. forebears on K Records--Beat Happening, Lois, Tiger Trap and others--Bis loves things like kitschy cereal box characters and Hello Kitty. Two words sum up its visual sensibility: "baby barettes." The EP The Secret Vampire Soundtrack even opens with the words "sugar, sugar, candy pop / just don't let the music stop." Bis currently has a U.S. release titled This Is Teen-C Power out on the Grand Royal label. It includes the band's four extremely hard-to-find import EPs. Atari Teenage Riot: This Berlin-based industrial noise/electronica band put on a performance that combined the sonic technics of rave music with the in-your-face theatrics of rock & roll. The Riot's record is on the ultragroovy, Beastie Boys­owned Grand Royal label and is sure to be much written about, if not heard. Dwight Twilley: In 1978, Dwight Twilley was a much-vaunted pop-rocker who made Beatlesesque music in the vein of Big Star, Shoes and the Dbs. Unfortunately, he hit the airwaves about five years too early to take advantage of "new wave." Back then, he had one hit--"I'm on Fire"--collaborated with Tom Petty and put out a couple of great records; 17 years later, he's suddenly back with a greatest-hits package on EMI called XXI, which includes two new songs. At his showcase, it was apparent that he is a man for whom time has stood still. He still looked great, and his music--which was once ahead of its time--sounded peculiarly timely. Fans of Petty, the Posies and Oasis ought to love Dwight Twilley. The Old 97's: One of a group of bands under the banner of the "No Depression" movement, this Dallas-based band plays country-tinged roots rock a la bands such as Uncle Tupelo, the Georgia Satellites and the Mekons. 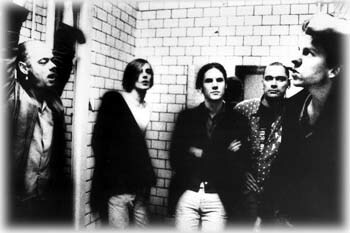 The group's new album, Too Far to Care, is Texan to the core, however, meaning that the band's sound is less eclectic and more heartfelt than Wilco's, twangier than Son Volt's and more serious than the Supersuckers'. Musically, it's not breaking any new ground, but it does manage to plow up some pretty fun tunes along the way. The Hi-Fives: On Saturday, Berkeley's own Hi-Fives played a showcase that was almost impossible to get into, and no wonder--although the band is riding the tail end of the Green Day­driven punkity-rockity revival, this surf-inflected quartet plays swift and clever poppy punk with hilarious lyrics. The Hi-Fives perform locally all the time and will open for Rev. Horton Heat at the Trocadero on April 11.